Biyo biometric vein scan of a right hand is used to make payments without cash, checks, or credit cards. Technological developments in electronic buying and selling are rapidly moving us closer to the fulfillment of the Biblical prophecy concerning the Mark of the Beast. The Apostle John predicted in the Book of Revelation that the final world empire would enact a law making it a requirement for every person to be marked in their right hand or forehead in order to participate in commerce (Rev. 13:16-17). Without this Mark, people will not be able to buy or sell in any way. Think carefully about this: paper money will become useless, standard credit cards will not function, and it also means you will not be able to hold a job or maintain a bank account without having the official credentials represented by the Mark. Regardless of how much money and investments you might have had before the Mark of the Beast comes, you will not be able to access those resources afterwards without having this validating Mark in your right hand or forehead. However, the Bible also warns that anyone who takes the Mark will suffer the wrath of God for all eternity (Rev. 14:9-11). Therefore this will become a major decision point that is critically important for everyone to understand. If you take the Mark, you are effectively swearing allegiance to the Antichrist’s empire and Satan’s global system of evil, which the Bible calls the Beast. The only fate left for those who take the Mark is a fearful waiting for the terrifying wrath of God and eternal damnation at Christ’s Return. However, for those who dare to refuse the Mark, they will be immediately cut off from society. In refusing, they will be openly stating their rejection of the Antichrist’s system while demonstrating their allegiance to God. For those who have faith in Christ and don’t take the Mark, it will mean eternal salvation from the Lord’s wrath and judgment. For this reason, refusing the Mark is absolutely essential as an important part of the path to safety and salvation in the End Times. The Mark of the Beast is now getting closer to becoming a reality than many have imagined. The recent commercialization of biometric identification technologies and the vast global network allowing the electronic transfer of digital bits of money are both keys to this development. 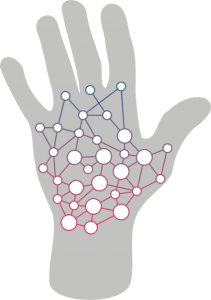 These technologies are now coming together to allow people to make purchases using the identifying characteristics of their hands, eyes, or face. A major turning point in the use of biometric recognition occurred in 2013 when Apple started to implement fingerprint scanning capability into the iPhone’s home button. Initially this was only used to access the phone from the lock screen; however, it also ended up starting a revolution in making biometric purchases. Only a couple years later Apple Pay along with other smart phone enabled payment methods have suddenly moved the world toward biometrics for secure access and validated payments. 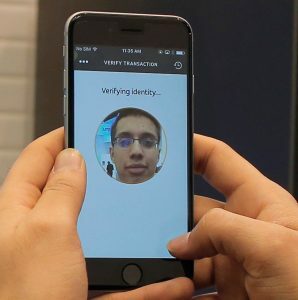 A couple years later, MasterCard started a program to have people use a fingerprint or a selfie picture of their face using a smart phone app whenever they want to make a purchase. The biometric scan resulting from this procedure verifies the person’s identity without the use of a password or PIN, both of which can be stolen or forgotten. This process thus combines a credit card with a biometric scan to authorize and secure a payment while helping to prevent fraud. The first trials of this technology began in the US and Europe in 2015, and was tried again in Canada in 2016. The results of these trials were very successful. MasterCard concluded that nine out of ten participants would like to use the biometric identification system instead of remembering a password or PIN to make purchases. MasterCard selfie biometric face scan is used to verify identity before making a purchase or payment. Some biometric payment processes are now being done even without credit cards or debit cards or even without using smart phones. For instance, the company Biyo (formerly PulseWallet) has developed technology that uses a digital scan of the vein patterns within the right hand to positively identify a person making a purchase. If the person has gone through a simple registration process with Biyo using a credit card and having their right hand scanned, then all they need to do from that point on is to have their hand scanned using a special device at the checkout register. A successful hand scan shows positive identification and allows a purchase to be made, while the owner’s credit card account is automatically debited with no need to use cash, checks, or cards. The benefits being touted for this system are that there are no passwords or PINs to remember, no money to lose or have stolen, no wallets to misplace or worry about, and the use of the strong biometrics of unique hand vein features provides positive identification with no fraud. Although this is not the final Mark of the Beast, these steps toward the use of biometrics for buying and selling will further make possible the implementation of the Mark in the very near future. Other companies implementing this technology are using various forms of biometrics, including finger or hand scans, iris scans of people’s eyes, or facial recognition to allow for similar biometric-based electronic buying and selling. In addition, the applications for biometric payment systems that are now coming on line are global in scope and are happening in virtually every part of the world. Regardless of the technology or companies commercializing these devices and applications, it is amazing that the two most prevalent locations for biometric identification–hands and face–correlate perfectly to where the Bible predicts the Mark will be placed. In other words, the future biometric scanning device that will be used in the final world system according to the Bible will no doubt read the presence of the nearby Mark at the same time it makes an identifying biometric match. A Mark in the hand will be read at the same time as the scan of the hand or finger. A Mark in the forehead will be read at the same time as the scan of the eye or face. This two-factor biometric/Mark identification process will make it virtually impossible to fraudulently make purchases—or for anyone to participate in buying or selling without being Marked and biometrically identified and validated. “…after working with developers to uncover and trial new forms of secure account login, embeddable, injectable and ingestible devices are the future for mobile payments”. LeBlanc went on to discuss the possibility of using wearable tattoos that incorporate a thin microchip, which can be placed directly under the skin. Biometric scanning coupled with embedded microchips may turn out to be the final configuration for the Mark of the Beast! The Bible amazingly predicted these developments almost 2000 years before they were destined to come to pass. Seeing that these and many other prophecies of the Last Days are now being fulfilled exactly as written, how close do you think we are to the Antichrist’s final system and the end of the age? When this prophecy ultimately comes to pass, remember one thing: DO NOT GET THE MARK OF THE BEAST!